Folio. 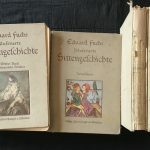 3 vols in 6 books. Each volume divided in two. Titles: Die Renaissance; Die galante Zeit; Das burgerliche Zeitalter. Illustrated with hundreds of text illustrations and plates, also coloured. Cloth with title and colour images on front covers and spines. Very worn, spines damaged and prevalently detaching and held with stitches. Three vols with blue edges. A poor copy, though good internally. Next Next post: CROSS, Wilbur L.